Being spun in 360s, at 120mph, by the photographer holding onto my hand. I am not an adrenaline junky. Sure, I've been set bouncing off the ceiling by a runner's high and shrieked at the top of my lungs on a few roller coasters, but I've never been the type to do anything in search of an adrenaline rush. 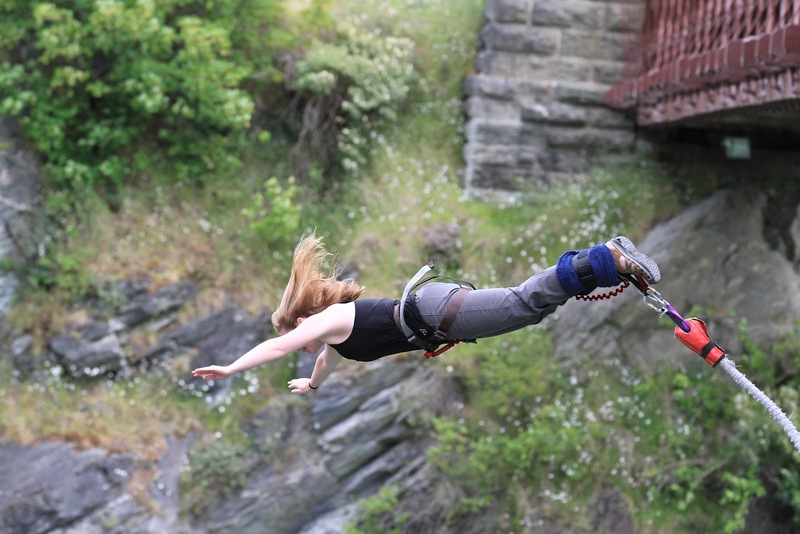 So when I planned a tandem skydive from 16,500 feet and a 43-meter (~141 feet) bungy jump into my trip to New Zealand at the end of last year, it was more because I was curious about the experiences than because I was in search of a thrill. Each of these experiences deserves its own post (with video!) down the road, but they had something in common that blew me away: freefall. I don't know what I expected freefall to be like but "amazing" wasn't a word I expected to use after the fact. So it surprised me when I did, over and over and over again. Freefalling out of a plane and freefalling after hurling yourself off a ledge are two very different sensations but - for me, anyway - they both involved an element of pure, undiluted joy that took me completely by surprise. You can see it on my face in the photo above: we were less than 15 seconds out of the plane, hurtling toward the ground twice as fast as a car on a highway, spinning in the air over the very northern edge of New Zealand's South Island...and I couldn't have been happier. For 75 seconds, I was soaring above the earth (plummeting toward it, actually, but it felt more like flying), air rushing past my face and roaring in my ears. Few things have ever felt so wonderful. Bungy-jumping is both much faster and, in my opinion, much scarier than sky-diving, but you still get just a split second of that soaring sensation before you realize you've left your stomach on the platform and are now hurtling downward at a worrisome rate of speed. The picture below captures that instant, and I love being able to look at it and remember what it felt like to be caught between earth and sky, seemingly weightless, just for a few moments. Just after launching myself off the bungy platform at Kawarau Bridge, right before gravity set in.